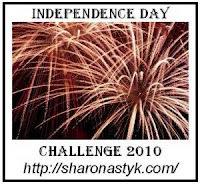 OK, I'm 2 weeks behind on my Independence Day Challenge 2010 updates! Sunday is the day I aim for, but due to my internet service being on and off for a week (mostly off), I got behind on my online record keeping. Plus, I've got a question for you, and writing all that out has taken some time. Three weeks ago we shared what we would eat and how we would fix it if our electricity unexpectedly went out for three days. I was interested in your responses, and picked up some good ideas as well as perspective. 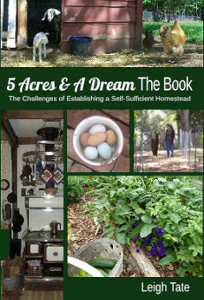 Even though my goal as a homesteader is to be able to grow and otherwise provide almost all of the food we consume, we still have a ways to go. A well stocked pantry really shouldn't wait until we get to that point. Also, not everyone has the same goal, though I think it's wise for folks to have emergency supplies on hand. If you're like us, then building a food storage is a slow process, mainly due to finances. Even so, I've found that just a couple of extra items each week adds up more quickly than one would think. Add to that the fact that I'm a bargain hunter, which means I work real hard to stretch our food dollars. I know I'm not alone in this, and always love to know where to find good prices. I'm going to share with you some of the places I've been able to stock up on inexpensive groceries, and I hope you'll comment on the same. Here are some of my favorites. If you click on the links you can use their store locators to see if one is near you. GO Grocery Outlet (United Grocery Outlet) - Never know what you're going to find kind of bargains. Great stock up prices. Can be brand names or off brands, including organic products. Selection varies with each visit. It's regional, although when I was trying to find their website I discovered a different Grocery Outlet serving the American northwest. Aldi - Nationwide. Set-up like a small warehouse, plan to bring your own shopping bags, recycle the cardboard boxes their products come in, or purchase reusable shopping bags. Mostly store brand products, which are very tasty. Not much on organics and natural foods, but good prices for basic groceries and especially produce. Big Lots - a close-out retailer, meaning they sell name brands at clearance prices. Not a grocery store, but every one I've been in has a grocery section. I keep my eyes open and can often find organic and natural foods at fantastic prices. Also health care products. Various dollar stores - I've found some good bargains here. Not always, but occasionally there are organic or natural food items, such as Dan's favorite Newman's Own salad dressing for a dollar per large bottle. Dollar Tree is an example. Anytime I'm near any sort of dollar store, I check their food and health care aisles. Discount grocery stores - these are usually independent, have no websites, and I've never known how to find them in the phone book. I just notice them by looking around or from someone else. Oftentimes they have close-outs, overstocks, clearance items, out-of-dates, dented cans or damaged packaging. Amazing Savings is a regional example. Dates do make a difference on some items, such as boxed whole grain items, which can go rancid. But canned goods don't matter, unless badly damaged. And everything isn't necessarily out of date. Of course food co-ops and buying clubs are excellent options as well. 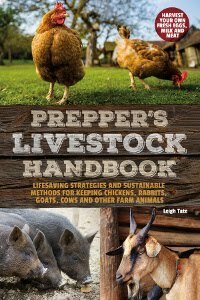 I get my locally, pasture raised meat from one. We do have an area food coop, which I plan to join once my duties as weavers guild president are over. 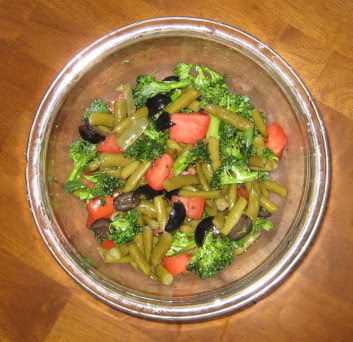 The one online bulk resource I've used is Bulk Foods Consumer Online Market. They have a somewhat limited selection, but on an order of $75 or more, shipping is only $5. If you've tried others, I'd love to hear about them and what you think. A lot of this is so routine that I don't think to list it all: kitchen scraps to chickens and compost (goats haven't been interested in anything I've offered so far); cooking and soaking waters to plants; barn cleanings to compost; chipped wood, cardboard, & newspaper for mulch; line drying clothes, etc., etc. Set up our summer kitchen again, to help keep the house cooler. Also, the hot plate uses less electricity than stove top cooking. trying to set a good example for the neighbors, some of whom evidently would prefer to see our property with golf course lawns and plasticized Americana landscaping. yogurt on cereal and fresh picked strawberries & blueberries. I've been having trouble getting my non-homogenized milk (they're always sold out), so yogurt is becoming more of a treat than a staple! cole slaw from garden cabbage & carrots. DH likes his sprinkled with Parmesan cheese. Very tasty with hamburgers made from local pasture-fed beef . Strawberry no-bake yogurt cheesecake - The idea for adding berries to the filling mixture came from Alison. I think you could use any mashed fruit. No photo though, sorry! about 1/2 to 2/3 cup garden strawberries (I popped small quantities in the freezer to save up for this). Blend yogurt cheese, sugar and mashed strawberries. Fold in whipped cream. Scoop into graham cracker crust and refrigerate. And what new keeper of chickens can resist posting a photo of their 1st eggs! 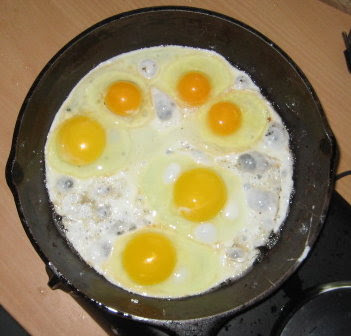 1st three pullet eggs frying with three store bought ones. I think that's it. To read what other Independence Days Challengers are doing, click here. I love that you are building your own pantry! And the egg shot..priceless! I don't do a lot of price shopping simply because I would have to travel so far that it would eat up any savings. The store I do shop at is just about all organic/natural foods and they have great weekly specials. They also are champs about special ordering stuff. They sell my natural(expensive) canned dog food for close to cost plus if I buy a case, I get a 10% discount on top of that. That goes for anything if you buy bulk. It's a nice store and we are lucky to have them so close, plus I like that they are a small independent chain. I really really try to buy locally for everything. How are the goats doing? And the kittens Leigh? I can't compare most food stores, apart from Aldi they're not available in ireland. and aldi is too far away for me to reach without car (they don't deliver here). though I take the opportunity to stock up when visitors drive around with us:) we do however keep emergency rations, esp. after the last winter ice-no-shop! the downside of that is that you have to be good with record keeping to be able to use and exchange all the foods before they spoil! We're always trying to trim our seemingly-gigantic (at least for 2 people and 1 dog), grocery bill. I checked out your links, and we do have a Big Lots near us. I've never been and never thought to look there for groceries and household products. I'll have to check it out sometime! Great to see the first eggs in use!! The recipes look great! I love summer fruit! Theresa, your store sounds exactly like what I wish we had close by. We do have a natural/organic/bulk store, but it is small and has extremely limited selection. The kittens are very sweet and beginning to catch on to what's off limits. Riley seems really intelligent and catches on quickly, Katy less so, but she's a good learner too. Bettina, I agree, keeping things rotated isn't an easy job. My biggest problem is that I seem to forget things. Of course, I've been rearranging which doesn't help. My freezer though, I really need a better way to keep track of what's in that! Sara, good point about critter chow!